The story of humans and bears definitely isn’t always a friendly one. While there are some very timid and shy types of bears some of them are highly aggressive. Those are the ones often involved in attacks on humans. Many people in society lump all bears together so they have this picture of them being evil animals that we should fear. Among the aggressive types of bears are the Polar Bears, Sloth Bear, the Brown Bear and the Black Bear. There is no denying that bears are strong and powerful animals. They are fast and have sharp claws. Yet most of them are just doing what they can to survive. If they are surprised in the wild or fear for their cubs then they are going to be more likely to attack. 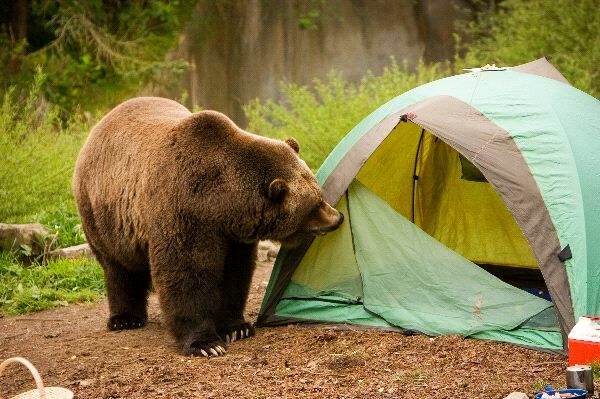 What you don’t see is that people all over the world wonder into locations where bears live daily. They can explore the area, camp, hike, and more without a bear every bothering them. Just because a person doesn’t see a bear doesn’t mean that the bears around didn’t see them! Yet when one bear does attack a person it is media news in no time at all. Thanks to the internet it doesn’t take long for the story to get out. There is absolutely no truth to the rumors that bears attack humans to feed on them. The only known bears to actually consume humans they attack are Polar Bears. Many people do survive such an attack from other bears. Once the bear feels they are not longer threatened they will walk away. Humans continue to take over land that these bears were once free to roam for food and shelter. The desire to live close to nature should mean you take on the risks of running into bears and other animals. Unfortunately most humans would rather see the bears destroyed. Ranchers have a struggle with them because cows and other animals they are raising can easily become a meal for a bear. When other food sources are scarce this will be even more of an issue. Many hunters around the world love the challenge of getting a bear. They are even more enticed by those that are labeled as being dangerous. It adds more of a thrill to their adventure. Even in areas where bears are protected illegal hunting continues to be a huge problem. Making money off of the fur from bears is also why they are killed. There are bears killed in order for people to get important raw materials. Arctic people that live in the same location as the Polar Bears like Inuit, Yupik, Chukchi, Nenets, Russian Pomors and others use almost all parts of captured animals for survival. Such a large bear is certainly going to offer enough food for a family to eat on for a very long time, fat for food and fuel and fur for clothing. Sometimes bears are killed for cultural use. For example the Chinese use parts of the body to grind up for various types of medicines they still use today. Not everyone in search of bears though is out to kill them. Instead they often will kill the mother so they can take her offspring. The young may be sold illegally as pets or even to be part of circus acts. There are many wonderful humans out there though with a sincere desire to help bears live a full life. They are aware that some of the species are in danger of becoming extinct. They continue to educate people about bears and to help pass laws to preserve the land where they live. These types of efforts can be slow moving though and that makes it hard to get the level of protection needed in place.